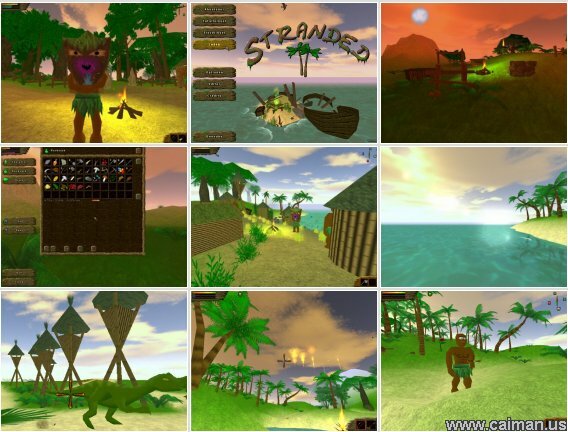 Caiman free games: Stranded 2 by Unreal Software. The game starts with a nice cutscene where you see yourself struggling to keep your boat floating in a heavy storm. 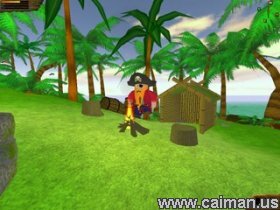 The boat explodes and as expected, you strand on an island. The objective of the game is doing some quests (either given by a certain situation or an NPC) that will help you get closer to your cosy living room back home. The quests are quite easy, but you need to put some effort into it. Of course, there is much more than just that. You have to make sure that your tummy is filled, that your throat is oiled and that your eyes may lay down or else you will lose health and eventually die. Food, water, defending yourself from dangerous animals and shelter is something you will have to take care for on a daily basis if you want to survive. Food can be gathered by hunting animals, water can be found by pressing leaves or drinking from a well, an arsenal of weapons will need to made for your defence and a shelter will require your construction skills. You might have noticed, but you won't come far when you don't have the proper tools. If you start experimenting with the resources at hand, you can easily make your tools and weaponry. A stone and a branch will make a hammer or a spear, a branch and a vine will make a slingshot, etc. Same goes for many other things, but I'll leave it up to you to worry about it. The game offers a lot of freedom. You can decide whether you want to go fishing or you can go hunting or you can spend some time building a tree-house or you can start wondering what you can do. Really, there are many things you can do and it is really difficult to get bored. 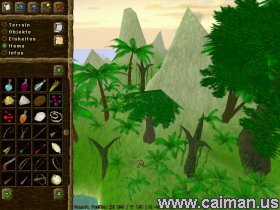 The `Adventure mode` does not give you so much freedom (limited resources and all) but the `Random Island mode` doesn't give you any quests and there you can really enjoy your freedom at full. I will advise that there are some quests that makes you roll joints or harvest marijuana leaves and it is up to the parents consent if they would let their kids play with this game or not. Fortunately, the game itself advises against the use of marijuana and the effects of smoking a joint in the game does not contribute to your survival. The input of it in this game adds a humoristic tone to the game and that is not such a bad thing in my opinion. The graphics are nice, the sound is terrific and the gameplay is excellent. This game has really impressed me and the makers have made a tremendous effort in making it. This game is well worth your time downloading and playing.